1 Me: It's been four years since I started this comic. That's a long time to be doing a single creative pursuit. 2 Me: I never imagined it would last this long, and it's been fun, but I think this is as good a milestone as any to move on. 3 Me: I want to thank everyone who contributed over the years. The friends who I showed #1 to and they said, "Ha! Make another one!" 4 Me: Then the ones who posted links on their sites and pulled in a few more readers. In fact everyone who ever pointed friends or strangers here. 5 Me: Too many inspirational cartoonists to mention, but significantly Charles M. Schulz, Goscinny & Uderzo, Hergé, Murray Ball, Gary Larson, and Bill Watterson. 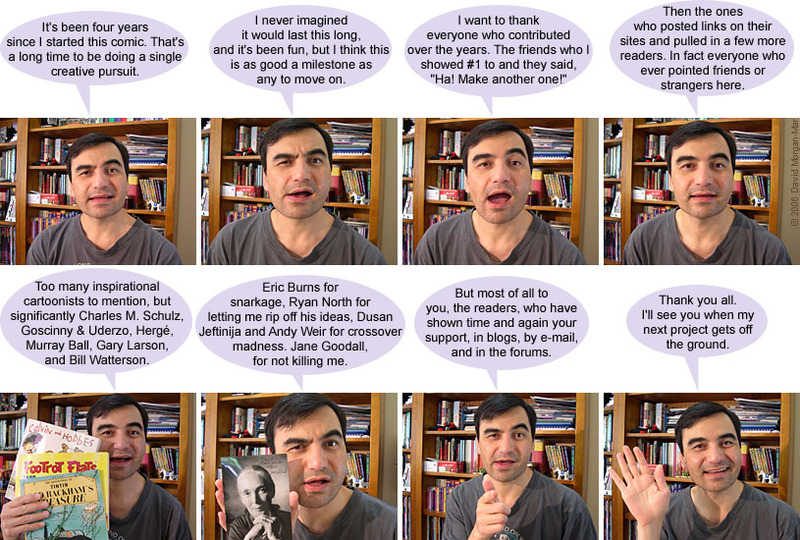 6 Me: Eric Burns for snarkage, Ryan North for letting me rip off his ideas, Dusan Jeftinija and Andy Weir for crossover madness. Jane Goodall, for not killing me. 7 Me: But most of all to you, the readers, who have shown time and again your support, in blogs, by e-mail, and in the forums. 8 Me: Thank you all. I'll see you when my next project gets off the ground. 2016-08-17 Rerun commentary: This was a deliberate misdirection and chain-yank when it was first published. The trick being that the "ending of the project" was the ending of the fourth year of the comic, and that the "next project" was the beginning of the fifth year. Of course many people didn't realise that at the time, and thought this was the end of the whole thing. If it was, then a lot of storylines were left up in the air. But generally the readers who contacted me about this strip expressed understanding, mixed with mild disappointment, rather than anger. Geez, you're such nice people and I pulled this nasty trick on you. I feel bad now! Last Modified: Wednesday, 17 August 2016; 03:11:03 PST.